NEW YORK -- When you walk into Jonty Jacobs, it's easy to feel like you're in any of the other dozens of boutiques in the shop’s tony West Village neighborhood. The shelves are made of an eclectic mix of dark wood. An iPad sits on the counter ready to take credit card payments. Trendy muzak wafts through hidden speakers. The store’s chic environs aren’t devoted to selling designer clothes, custom makeup or stationery. Instead, Jonty Jacobs specializes in biltong -- a South African jerky-type snack made of cured beef. Monique St. Luce, a South African native, and her husband, Camran, started their company a couple of years ago as a way to help deal with Monique’s pregnancy cravings for a favorite snack from home. But they stumbled into the business at a time when so-called meat snacks are having a moment. 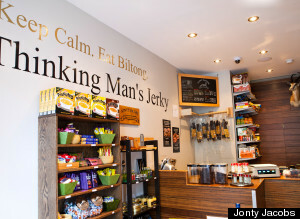 Jonty Jacobs, a West Village biltong shop. Once found mainly in truck stops and gas stations, packaged dried meat is turning up everywhere from the aisles of Whole Foods to "jerky outlets" to West Village boutiques. “It’s really going from a convenience-store road trip item almost to an hors d'oeuvre,” said Sherry Frey, vice president of Nielsen Perishables group, the division of the consumer-trend company that tracks sales of fresh food in grocery stores. Growth in sales for meat snacks, a broad category that includes everything from Slim Jims to bars made of dried meat and mixed fruit, far exceeded the growth of more traditional snacks like chips, candy and nuts last year, according to data from Nielsen. Between 2009 and September of this year, total dollar sales in the category grew from $1.58 billion to nearly $2.5 billion, according to data from IRIWorldwide, an analytics and consulting firm. Sales of meat snacks have exploded over the past 6 years, according to IRIWorldwide data. Of course, meat snacks still represent much smaller sales figures than categories like "salty snacks," which includes chips and pretzels, Frey noted. But the meat snack group is growing fast. "It's got a lot of upside opportunity," she said. According to Frey, Americans’ renewed hunger for protein is behind the snacks' explosive success. Increasingly health-conscious shoppers are becoming more aware of what they put in their bodies, and they’re getting the message from the media and the health and wellness community that protein is a better source of fuel than fats, sugars or carbs, she said. More stores are lining their shelves with with products, including yogurt and breakfast bars, that advertise their protein content. Americans’ interest in protein is “cyclical,” Frey said, recalling the Atkins heyday 10 to 15 years ago, when protein was particularly popular. But the nation's current protein obsession is a bit different, she said. “Right now, I think we’re on the beginning edge of protein in different forms,” with customers lusting after protein “on the go,” she said. Indeed, total meat sales have grown by about 5 percent so far this year, while sales for meat snacks are up 11.2 percent, according to Nielsen data. That’s partly because raw meat has become so expensive in recent years due to drought in California and other states. But it’s also because Americans are increasingly replacing meals with snacks, according to Mary Chapman, the director of innovation at Technomic, a food industry research firm. As a result, they're looking for something a bit more substantial than a tortilla chip or a handful of M&Ms. 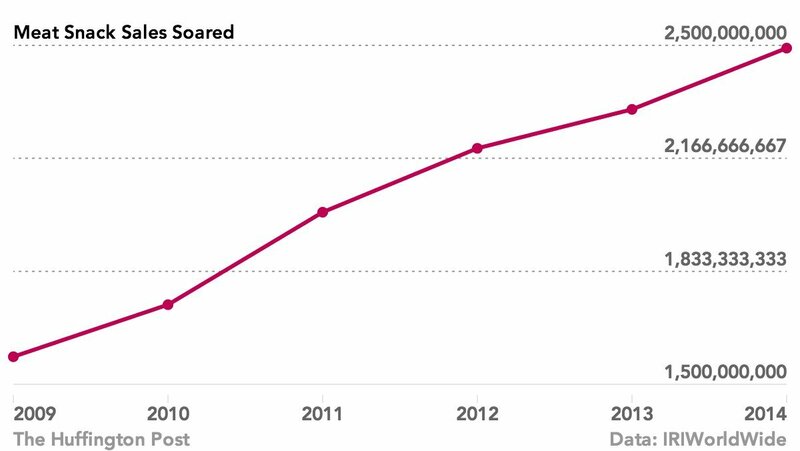 This chart shows the growth of several popular snack categories over the past year, based on Nielsen data. Meat snacks are beating categories like chips and candy. The rise of outdoorsy and back-to-basics fitness regimens and diets -- like CrossFit and Paleo -- have also helped to fuel the growth in portable proteins. KRAVE Jerky, one of the first companies to enter the gourmet jerky market, was the brainchild of Jonathan Sebastiani, a marathon runner and vineyard owner who was looking for a tasty snack that would give him enough energy to train. Sebastiani’s approach seems to have worked: KRAVE claims to be the fastest-growing meat snack brand in the grocery aisle. Women are a particularly hard sell. And it’s easy to see why, with some of the most famous ads for jerky targeting a hyper-masculine audience. A Slim Jim ad from 1992. To try to attract more women, KRAVE uses Jillian Michaels as a spokeswoman for the brand. The company also aims to lure women by working with female dietitians and nutritionists who can provide legitimacy to the claims that jerky is both healthy and something that women eat. KOOEE!, a meat snack company named for an Australian expression people say when they reach the top of a mountain, uses a different strategy to get its product into the hands of jerky skeptics, according to Shaun Malligan, the company's founder. He combines it with something many non-jerky eaters already know and like: trail mix. “[Jerky] is sometimes a bit polarizing,” Malligan said. "I'd love to just try and bring it a bit more mainstream."